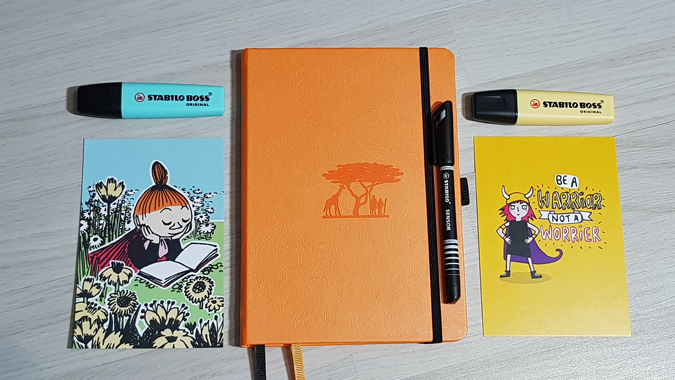 [Ad – previous collaboration] This post features a product I bought myself from a brand I have previously worked with. 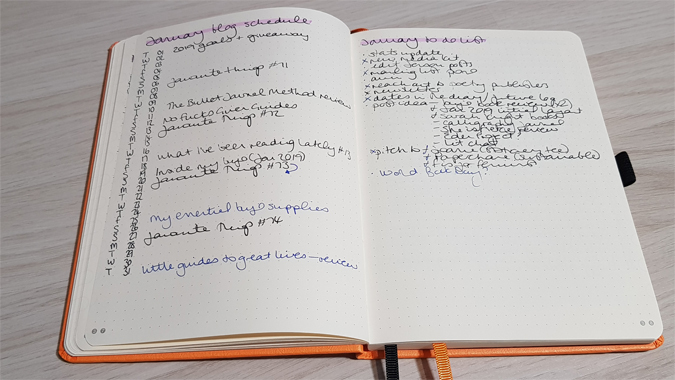 When I showed you my January bullet journal spreads a few weeks ago, I said I’d be back with a reflective post looking at how useful they were. 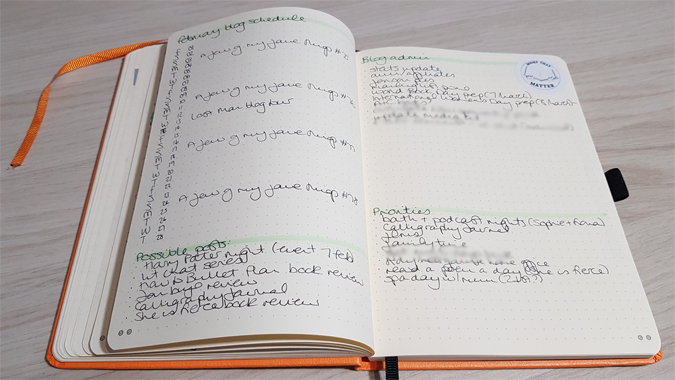 I made a conscious effort to keep things super minimal so that I’d be productive rather than struggle to maintain something too elaborate and I’m pleased to say it worked, although there are still a few things I’d change. My index has a lot more content than it did this time last month. I think it’s safe to say that, if I’m using 20 pages per month, this notebook certainly won’t last the year. I’ve slowly been adding things to my future log, which is so useful. I’ve blurred out a few things in the pictures of this post just to avoid a few over-shares and to keep the lid on some upcoming campaigns. All will be revealed soon enough. And yes, I was gutted when my favourite black pen ran out halfway through the month and it took me a few days to buy a new pack! But I’m learning to embrace the mess and mistakes. 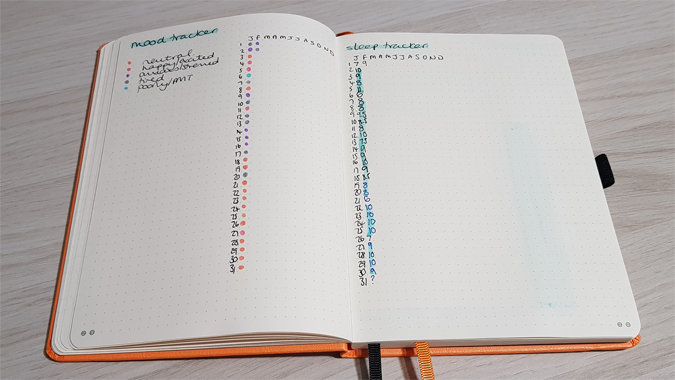 One of my favourite ideas from The Bullet Journal Method was Ryder’s 5, 4, 3, 2, 1 spread. This doesn’t get updated all too often but it’s a fun spread. I’m very goals-oriented. 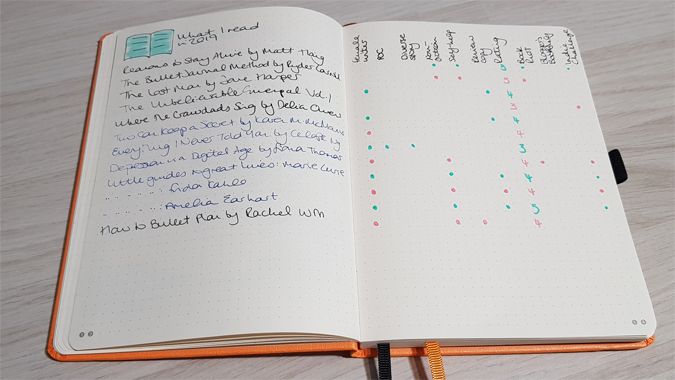 I quite like the simplicity of my books read tracker but I think I’d change up the different topics next time. Although it’s helpful to know that I’m not doing very well with my goal to read more diverse titles this year. After seeing four films over the Christmas and new year period, I’m disappointed to say I’ve only seen two films so far this year. The beauty of reflecting every month is that I know which areas I want to focus on. I didn’t set up too many trackers at the start of the year. What I wanted to focus on was a way of tracking my daily mood and sleep patterns. While these simple trackers don’t allow for things like changes in mood throughout the day or noting broken sleep, they’re so handy to look at at a glance. I decided to highlight the days where I slept at least eight hours a night but I wouldn’t do that again as too much highlighter use bleeds and it looks a bit messy. Maybe I should have highlighted the nights when I didn’t get eight hours, but I didn’t know at the start of the month that I’d be getting nine or ten hours sleep a night. 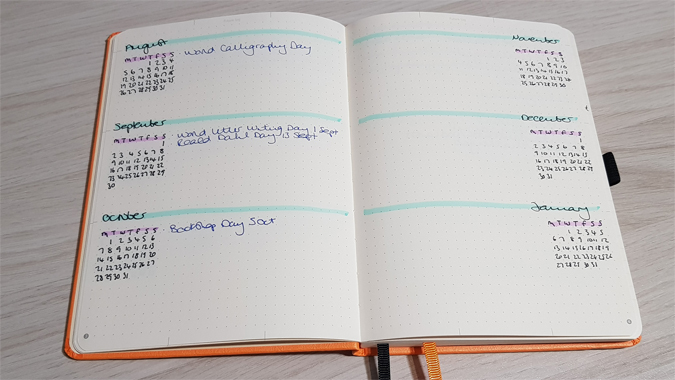 I use my planning spread for the blog and found the schedule useful. 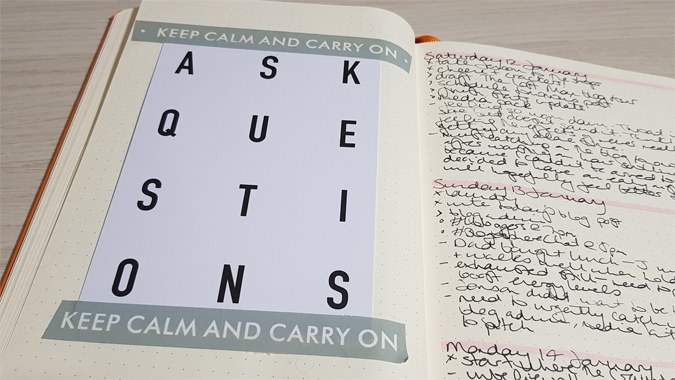 I didn’t refer to my to do list an awful lot, choosing instead to note tasks in my daily pages. More on that in a bit. I loved noting my daily and gratitude and self-care and this is something I’m carrying forward into February. It’s funny to see how much of an emphasis there is on food – and Luke doing the dishes! I’ve started adding some prints and tickets to my daily pages as a mini scrapbook, which I’m enjoying. I’m not very artistic so it’s a simple way of adding more personal touches. 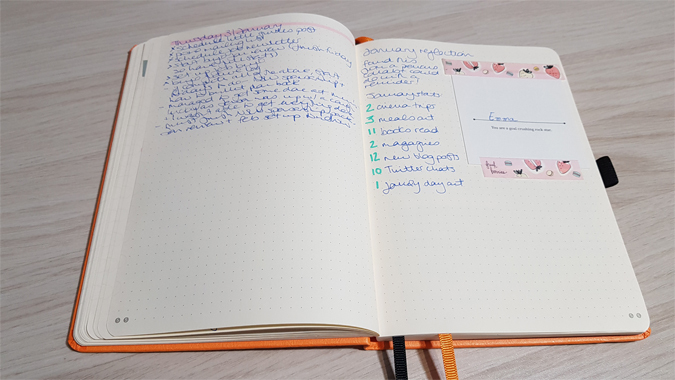 For my dailies, I often recorded lists of what I wanted to do in the evening when Jenson was asleep and, more often than not, migrated tasks to the next day. I knew early on that I’d want to change this up for February, which I’ll come on to in a minute. I added a few pages on reflection at the end of the month. 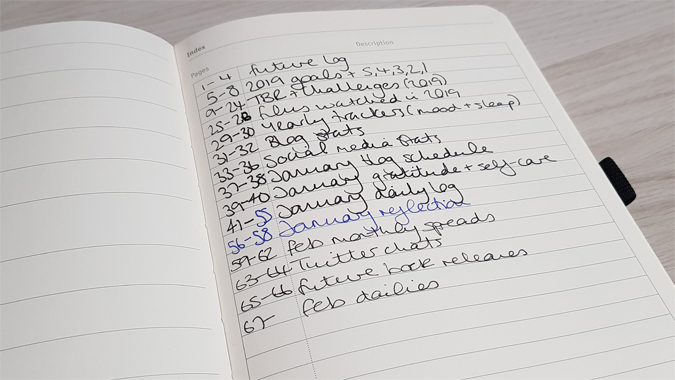 Last year I found that I benefited from reflecting on goals and tasks set, so I’m taking some time at the end of each month to reflect on my achievements and goals progress, as well as look at what’s successful on the blog so I can continue to improve month on month. I really enjoyed doing this for January and I think it’s going to be an important part of my bujo going forwards. Something I haven’t shared is my blog and social media stats spreads. 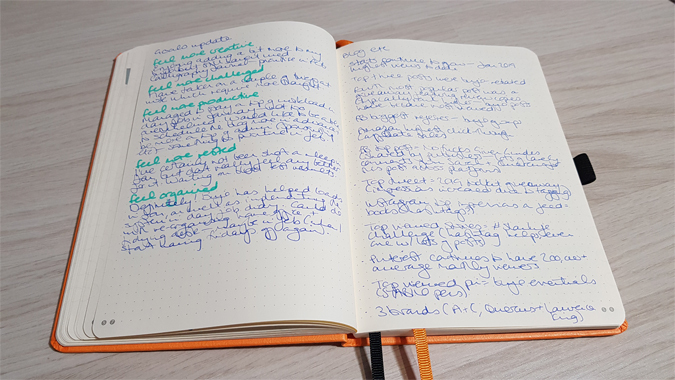 These didn’t turn out to be as helpful as I thought and I’ll be thinking of new ways to note the highlights in my bujo – I have a pretty extensive Excel doc too. It might be that I just develop the final page of my monthly reflection. 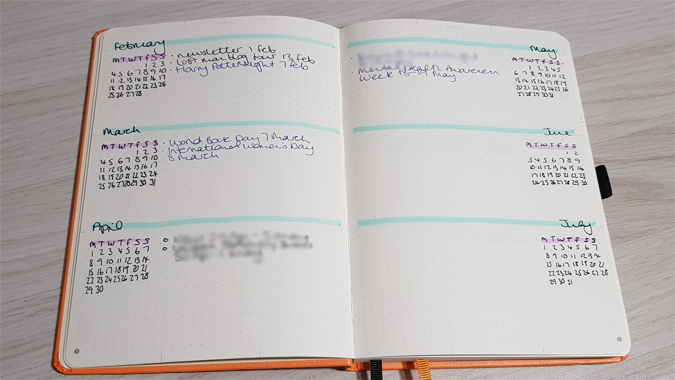 I’ve changed up my schedule spread for February to allow for the constantly migrated tasks in last month’s dailies. 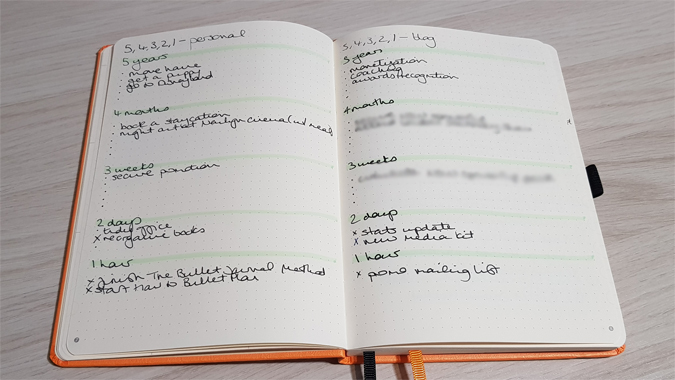 I’ve set it up so that it’s a running task list which I can refer back to (hello, extra Dingbats page ribbon!). 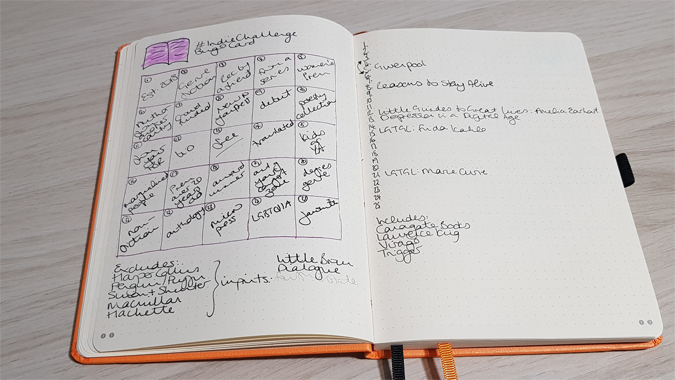 My dailies will focus more on regular reflection rather than tasks and events. 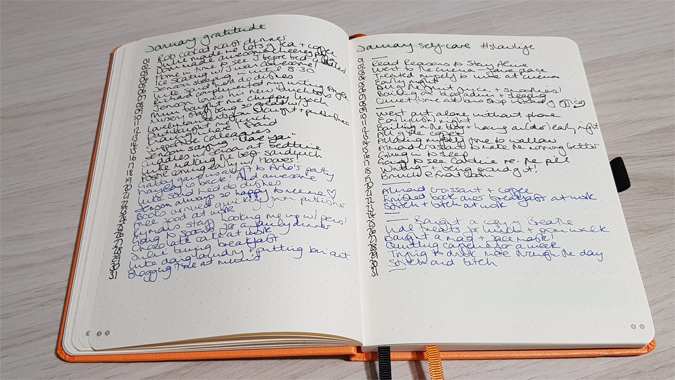 I also plan to create a separate spread for weekly Twitter chats to save room in my dailies. 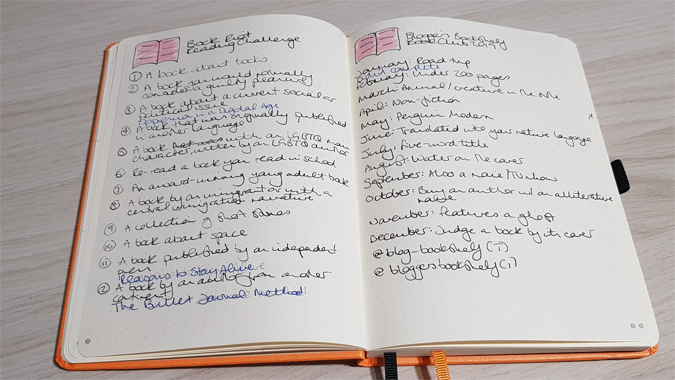 I’ve changed up the layout of my daily log ever so slightly and I already don’t like it. I’ll be changing it again for March. The only new collection I’ve added so far is a list of new book releases I want to check out at the library which aren’t available yet. 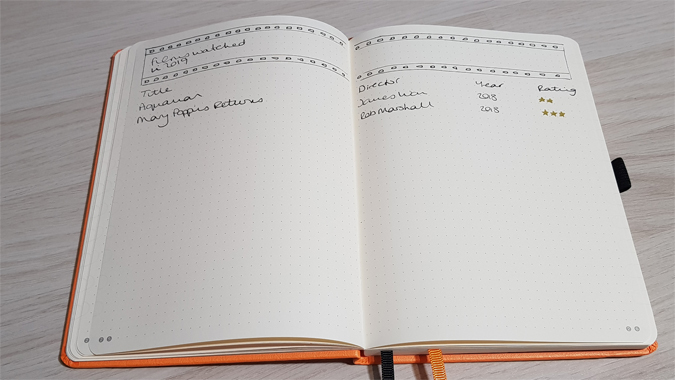 Have you changed anything in your bujo for the new month? 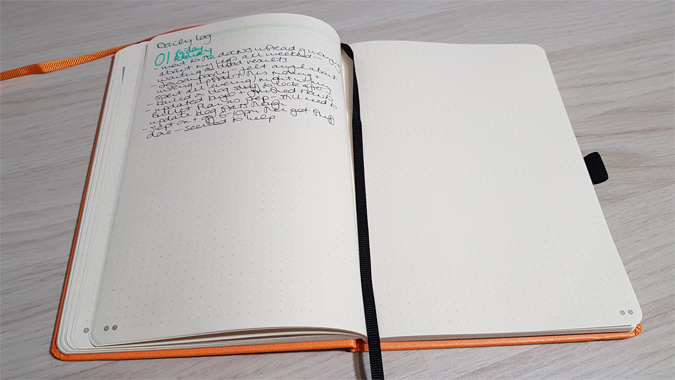 Journaling looks abit hard work for me especially as I’m trying to be less stressed and reduce my need for perfectionism. 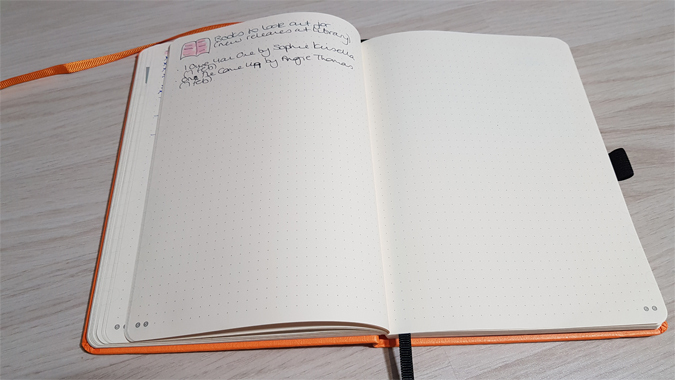 The bit I do like is the new titles that you want to read and look for on the library – this I must do but I’ll probably write them in the back of my diary. It’s different for everyone isn’t it. I’ve found having some time to reflect at the end of the day makes me less stressed and I’m learning to accept the mistakes rather than make sure everything is perfect. Wow, I like the look of it. Very practical! I don’t have a 100% bujo with the index and fancy spreads but I’ve been making lists to keep track of things. I’ve been more organized at least! Can’t wait for the Feb. update.